“What a pleasure to leave the solitude of the studio and connect with real, live, human beings via the Internet. My name is Philip Stead. 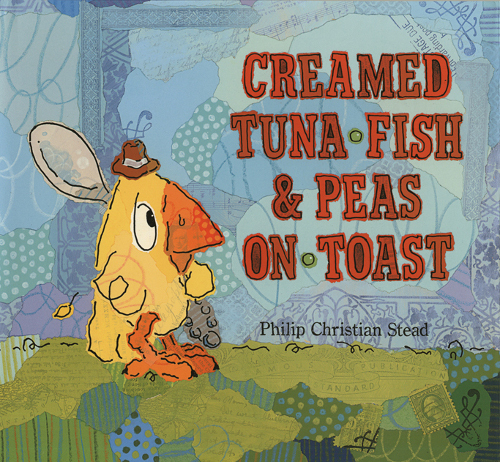 I live in Ann Arbor, MI, though much of the work from my first book, Creamed Tuna Fish and Peas on Toast (Roaring Brook Press, Fall 2009), was created while living in Brooklyn, NY. Like many artists, I’ve fled the city to make room for those better equipped to manage the ballooning rent prices. I feel very fortunate to work with Roaring Brook Press. My experience with Roaring Brook has been one that most artists only dream of these days. My early book dummy was approved by a single editor. I was then left almost completely alone for the eighteen months it took to create Creamed Tuna Fish and Peas on Toast. In my opinion, the chance that a piece of artwork has of retaining its integrity diminishes with each set of hands that touch it. Creamed Tuna Fish and Peas on Toast is based on a strange but true Stead-family story. In the mid-1950s, in a fit of rage, my Grandpa Jack buried his least favorite meal (creamed tuna fish and peas on toast) in the yard, even carving a headstone for the vile dish. All of the characters in the book are my real family members—my Grandpa Jack and Grandma Jane and their five children. 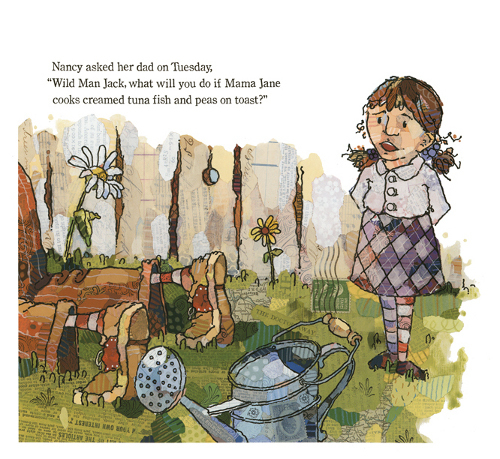 The artwork for Creamed Tuna Fish and Peas on Toast was executed in collage with acrylics and ink. The collage materials that I use—old postcards, atlases, report cards from the 1930s, shipping manifests, cemetery plot receipts, department store catalogs from the turn of the century, et cetera—come from a handful of junk shops in New York City, Ann Arbor, and Detroit. These shops seem to specialize in a certain kind of historically insignificant, yet aesthetically pleasing, paper ephemera. It’s a great mystery to me as to how these places stay in business. For fifty dollars, you can walk out with a healthy stack of paper goods that are of virtually no use to anyone but me. In addition to the vintage paper goods, I also use Color-Aid® paper. Color-Aid® is a company who’s entire business is the selling of paper sheets of pure color. Color-Aid’s claim to fame comes from the modern artist Josef Albers, who used Color-Aid® papers to develop his theories on color relationship in the middle of last century. In my work, I alter the papers by drawing patterns on them with crayon—polka dots, stripes, swirls. All of the type in Creamed Tuna Fish and Peas on Toast is hand-lettered, using vintage children’s letterpress sets from the 1930s, ’40s, and ’50s. 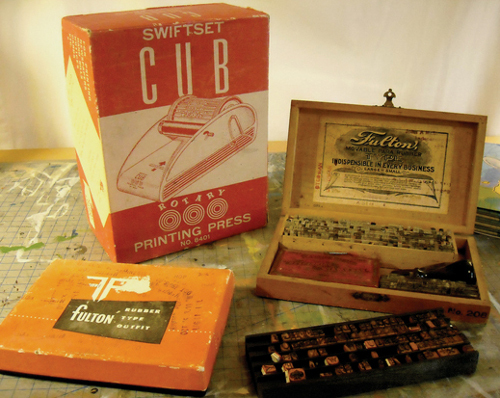 These letterpress sets are made of rubber, each letterform being about a quarter-inch in size. These sets are very difficult to find in complete form. Before beginning the typesetting process I had to recreate many of the missing letters by hand. 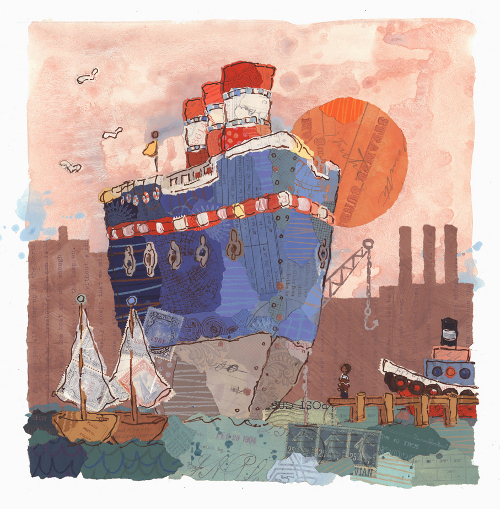 Now that my first book is completed and finding its way to a bookshelf near you, I’ve begun work on my second book, Jonathan and the Big Blue Boat (Roaring Brook Press, Spring 2011). 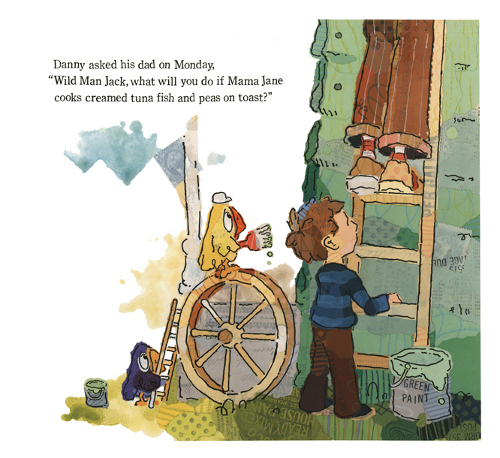 Jonathan and the Big Blue Boat is the story of Jonathan, a little boy who’s favorite bear, Frederick, is given away by his surprisingly insensitive parents. Jonathan embarks on a voyage on a big blue steamboat in an effort to recover Frederick. 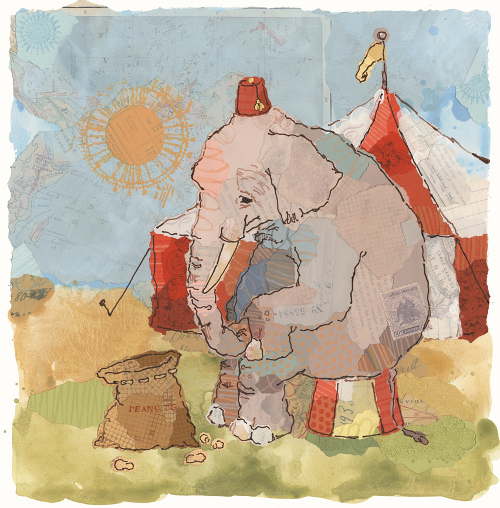 Along the way he meets some unlikely characters—a circus elephant, a mountain goat, a whale—who join him on his search. 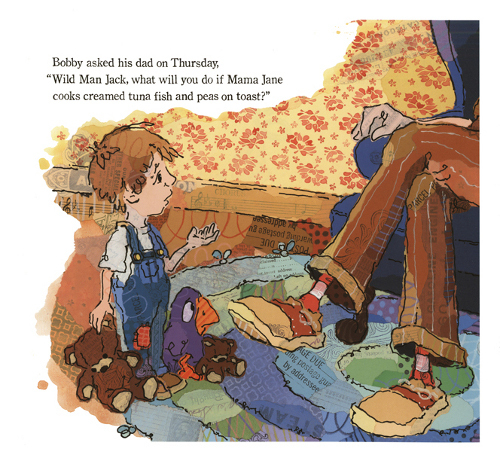 The art for my first book, Creamed Tuna Fish, was done all in collage. 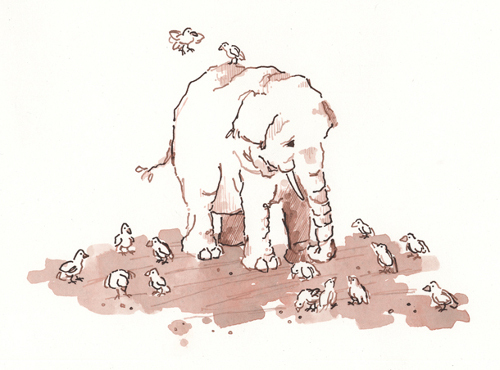 For Jonathan and the Big Blue Boat, I’ve decided to sprinkle in some spot illustrations done in sepia ink. 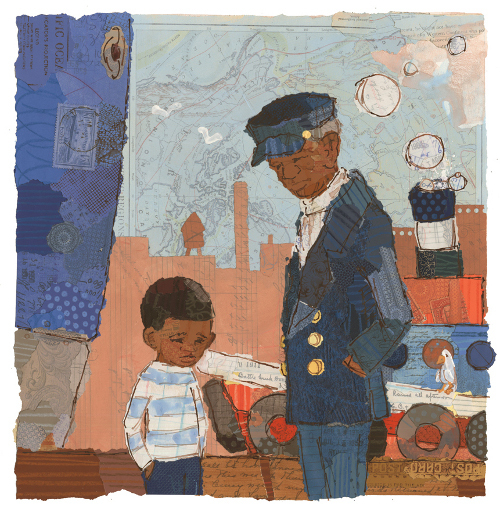 Jonathan and the Big Blue Boat is a very personal project for me. I’ve had a fascination with big ships since I was a child visiting the Great Lakes and watching the freighters on their way to the auto plants in Detroit. 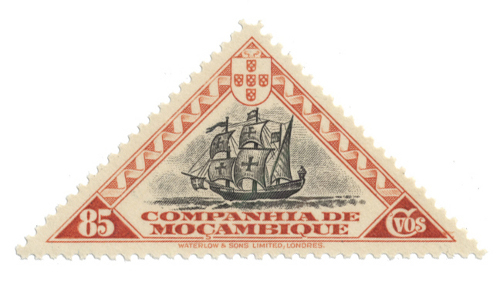 When I was ten-years-old, I began collecting stamps that featured ships in their artwork. I still have and regularly add to that collection. 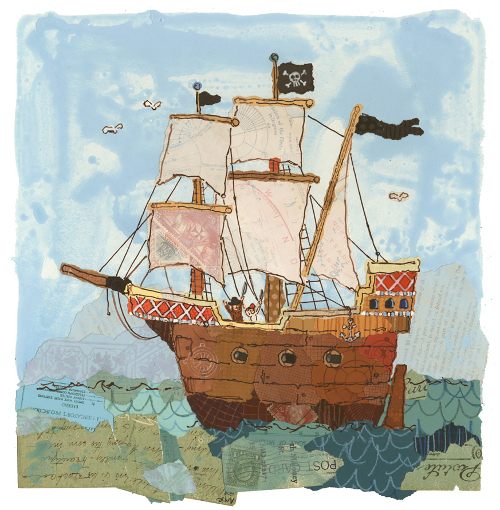 Many of those stamps have been used in the collage work for Jonathan, or have otherwise inspired certain images. Thanks again to Phil. Anyone else as intrigued by these books as I am? Guess we don’t have much longer to wait for the first one . 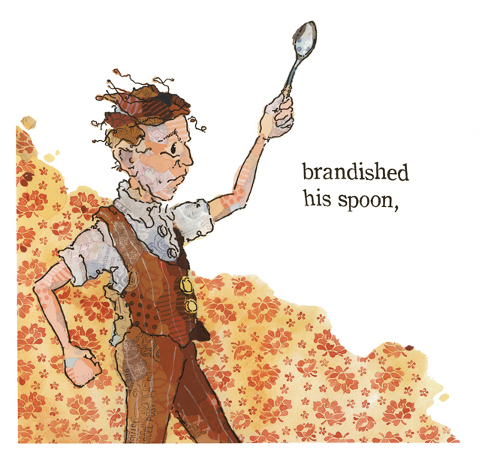 . .
All illustrations © 2009 and courtesy of Philip Stead. All rights reserved. I absolutely adore collage. The more of it that I see, the more I think it really is amazing and the artist has such versatility when using it. 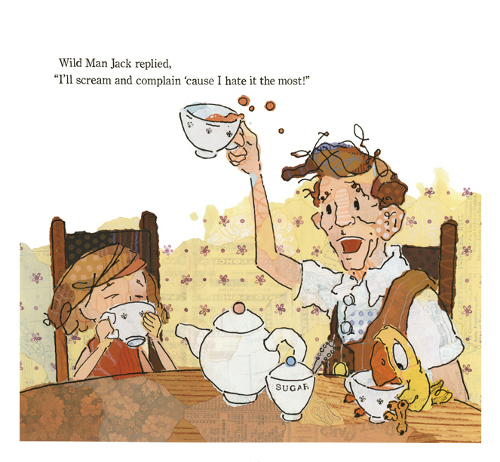 Will be looking for more of Mr. Stead and his stories — I’m really amused that he got to use his real family for this! OMG. I. LOVE. COLLAGE. And Philip’s work is real cute and real impressive. Thank you so much for featuring him and his work! I don’t understand though why his grandpa didn’t like creamed tuna fish and peas on toast. 😛 Sounds tasty to me! Hehehe. Have I mentioned that I. LOVE. COLLAGE . . . ? Thanks for featuring Philip’s work. As noted, the ‘Creamed Tuna Fish…’ story is true. I was there; I had to eat the stuff, and I was glad when my father buried it. Collage! Old papers! 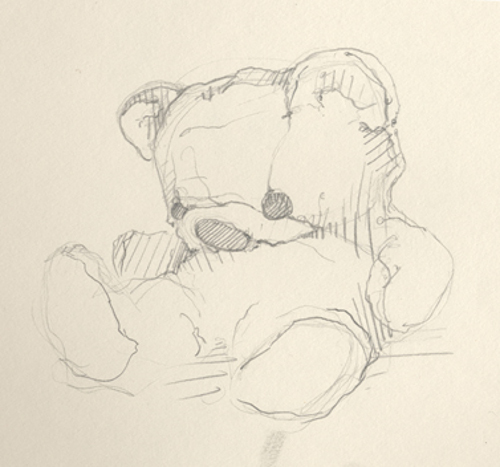 Sepia illustrations! Rubber-stamp lettering! Thanks for introducing us to such a cool debut artist! Lovely! 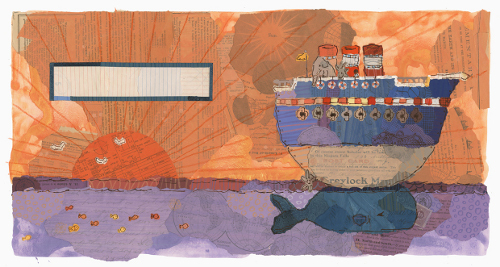 The problem with collage is that it’s made from such every day materials–so I think, oh yeah, I can do that, right? Hmmmm. Turns out it’s much harder than it looks, and now I am AMAZED at the work of collage artists. Beautiful work–thanks for sharing! Another absolutely fantastic interview! Wow! These collage images are so inspiring to me. I can’t wait to pick up both of these works. Thanks again & I just love this blog-thanks for publishing it! Your books are wonderful! 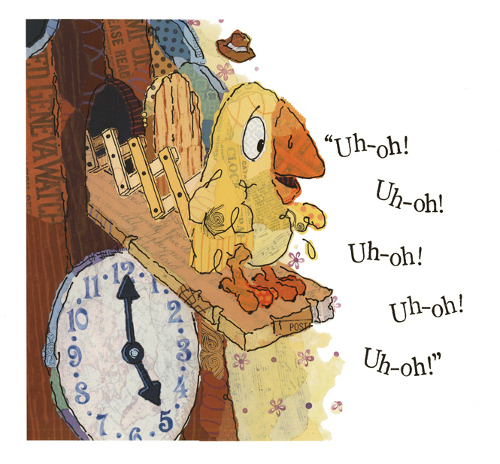 The process you used to create such delightful stories is awe inspiring! You will delight generations for years! Hi Martha. Unfortunately I don’t think we’re related. From what I understand my Stead family line arrived in Michigan from England around 1850 via my Great-Great-Great-Grandpa James. I am the social events coordinator for Alpha X Epsilon, Philadelphia Biblical University’s student education club. We are holding an education gala October 8, 2011. I would like to give out some nice gifts bags and door prizes. Would you be interested in donating any autographed books to be given away at the gala? Anything you give would be joyfully received.